Derek and I met when we were employed by the same software vendor in New York. 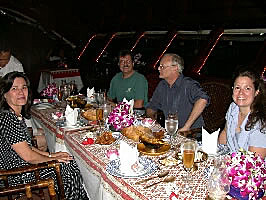 We, along with another coworker, Ken, became fast friends when we discovered we had many things in common ... like good food and travel. 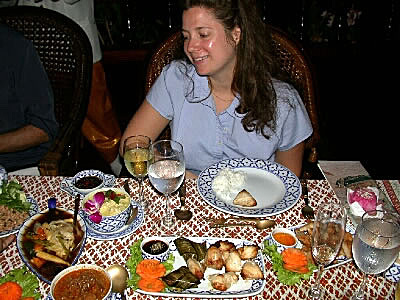 We soon formed an informal gourmet club and were often found spending the weekend at someone's house enjoying lavishly cooked gourmet meals and superb wines. 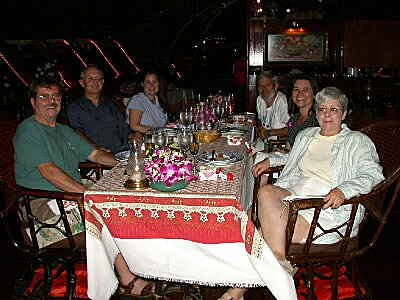 Unfortunately the group was broken when Derek relocated to Bangkok and Ken to Florida, but we managed to keep in touch and visit when we can. 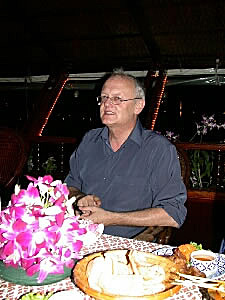 During our last trip to Bangkok, 1994, Derek was unemployed at the time and looking for something to do. 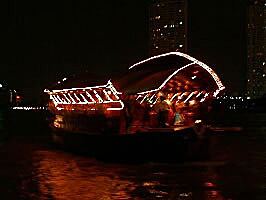 That came when he became involved with restoring the Tahsaneeya Nava rice barge and establishing it as the premier rice barge offering dinner cruises to tourists and locals along the Chao Praya, the River of Kings, in Bangkok. I must admit he couldn't have found a better calling as he is perfectly suited to lavishly entertaining friends and strangers, as if they had been lifelong friends, in such beautiful surroundings. 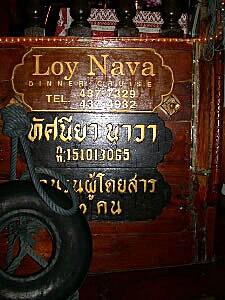 His taste are impeccable and anyone taking a cruise with Loy Nava Dinner Cruises will surely enjoy the evening as it will be memorable. To our surprise and delight Derek arranged to host us for the evening on a private dinner cruise. He made all the arrangements to have a driver pick us up at the hotel and deposit us at the dock near the Shangri La Hotel where the boat would pick us up. We waited patiently for the boat to arrive enjoying the scenery as we stood by the water's edge. 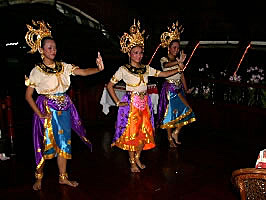 In addition to enjoying a typical Thai gourmet experience Derek also managed to talk the entertainers into staying for the additional voyage doing traditional Thai dances. 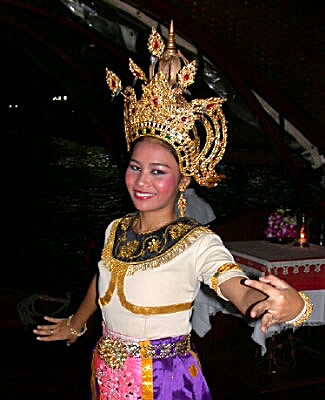 We enjoyed watching the girls as they danced and used their arms and hands in such an expressive way that only the Thai people can do. As always, Anne and I enjoyed our time spent with an old friend and were saddened when we left and knew it would be years before we'd be able to once again get together and lift a glass in friendship. Thank goodness for e-mail so that we can easily and quickly keep in touch with all the good friends we've made through work and our travels around the world.